In celebration of Nutrition Month, the Kidco Kitchen wants to highlight a very diversified grain that has become increasingly popular over the past decade, and it’s no wonder why! Quinoa has a delicious nutty flavour, is high in fibre and iron, plus it has a greater protein content than rice. Quinoa is one of the most protein-rich foods we can eat and a superfood to boot. It is a complete protein containing all nine essential amino acids and did I mention it is gluten free. What most people don’t realize is that you can take your favourite rice dish and substitute the rice with quinoa, making it equally delicious and healthier! Take our healthy version of Quinoa “Fried Rice” for example. 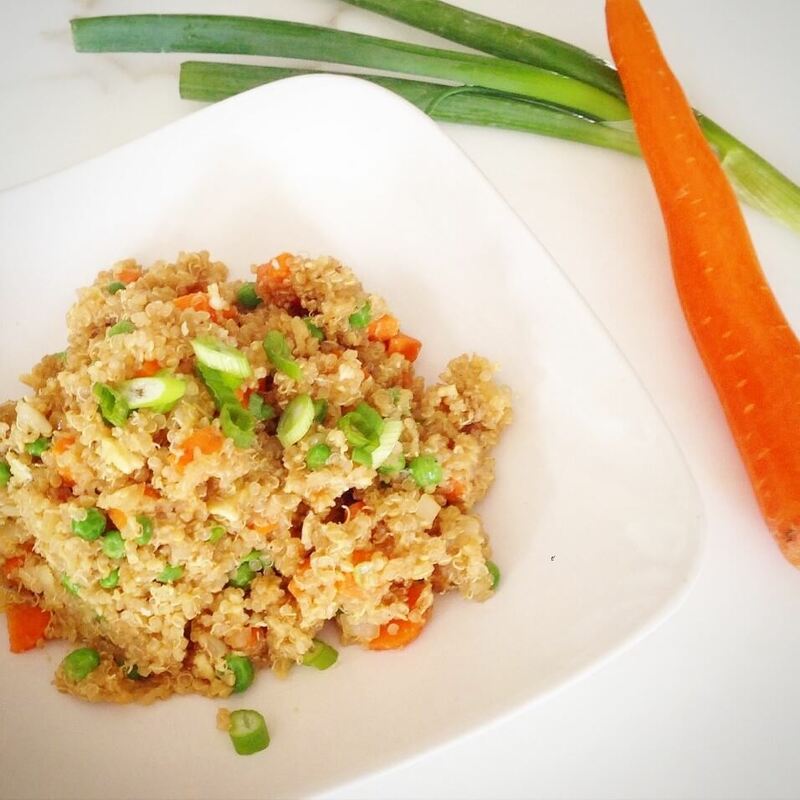 All you need is 4 cups of cooked and chilled quinoa, 2 eggs, 2 medium carrots peeled and diced, 1 small white onion diced, ½ cup of peas, 3 green onions sliced, 2 tablespoons of soy sauce, 1 teaspoon of sesame oil, and salt and pepper to taste. It is important to rinse quinoa (unless you buy pre-rinsed packages), as the seeds are coated with saponin, a bitter substance that layers the seeds for protection. All you need to do is place your quinoa in a fine-mesh sieve and run under cold water for 20-30 seconds while swirling it around! Quinoa is a healthy choice! It is easier and faster to cook than most carbohydrates. The ratio to cook quinoa is 1 cup of quinoa to 2 cups of water or stock. Stock is a great way to season the quinoa during the cooking process for added flavour! Bring the quinoa to a boil, reduce heat to low, and cover the pot. In 15-20 minutes, the quinoa will be fully cooked. Let sit for 5 minutes and fluff with a fork. After the quinoa has been chilled, sauté the onions and carrots in the sesame oil for 5 minutes. Add the peas and cook for an additional minute. Pour the sautéed veggies into a bowl and in the same pan, scramble the eggs (I love this part because it means I don’t have to wash 2 separate pans!). Add the scrambled eggs, sautéed veggies and soy sauce to the chilled quinoa and top with sliced green onions. The beauty of this dish is that it can be served hot, cold, or room temperature. It's not easy to pry picky eaters away from their favourite rice dishes, but with this recipe they may not even notice the difference! From our kitchen to yours…… Enjoy! Don’t forget to follow us on Twitter @kidcochildcare and on Instagram @cheflisaruscica!